The apartment has one bedroom and living room with kitchen. From bedroom is entrance to a terrace and access to a sunny garden. You can take breakfast at terrace or grill a dinner there. Apt. is located just 8 min from St. Vitus Cathedral in beautiful neighborhood at a tram stop. You can get easily to city center anytime and the airport is just 30 min by public transport. You can park for free on street during a weekend otherwise free parking zone is 4 tram stations far. Or I can register your car, so you can park anywhere on the main street. It costs 8 EUR/per night (paid at arrival). You should find anything in apartment you might need for vacation. Baby crib and dining chair are prepared for the youngest. 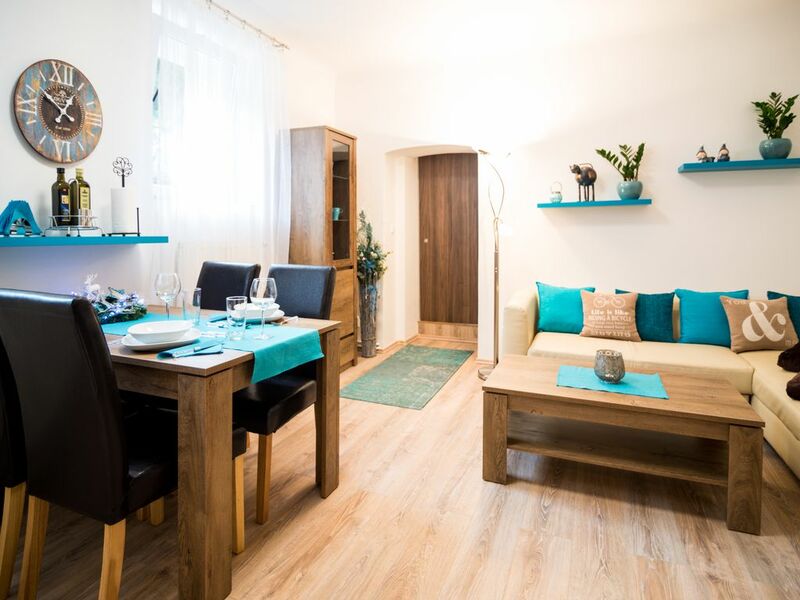 You can also check our 2nd apartment called Spacious 2 Bedroom Home with FREE WiFi Terrace + Garden, close to Prague Castle at the same address. The apartment is up to for 6 persons. The flat is well equipped and furnished, I hope that you will find there everything you need for vacation (according to pictures). Free WiFi , electrical grill to borrow, picture books about Prague an Czech Rep., some games, also candles for setting up the atmosphere. Leaflets with restaurant from surrounding and with Prague´s sightseeing tours and other attractions - you are welcomed to leave recommendations for others :) On the terrace you can use electrical grill free of charge and during a spring / summer season you can take herbs for cooking. You can use any candle in the flat (just do not burn anything) as well as any other consumables. In surrounding area of the place you can visit local brewery which is very popular and it´s restaurant is amazing. But there are more restaurants with different cuisine such as Indian, Vietnamese, Chinese, Italian and Czech of course. You can find many shops on a street and groceries are open till 11 p.m. Nearby is bike and Segway rentals as well and up on a hill is large park Ladronka, where you can rent roller skates or just chill out. Ladronka is connected with another park called Hvezda, where you can see even boars and deer if you are lucky. Both of the park are so beautiful you have to visit them if you can. We are living in the same house and parents are running flower shop here so you can reach us almost 24/7. I speak English fluently and slightly German. Parents speak Russian and German. Even though I spent 1 year in Austria and 2 years in Maldives and I am seeking people from different parts of the world I cannot promise you anything but I will try to be the most helpful. We are running this listing as family - me and my parents. We all live in the same house so you can meet us anytime. We are travelling quite lot, I spend 3 years from last 4 years abroad and I am looking forward meeting travelers. What we all really like is good food and beer :) We can speak English, Russian and German - so I believe we will be helpful. Parking on a main street possible during weekends. Working days are paid, 8 EUR/day at accommodation. Or at free parking zone, which is about 4 tram stops far - 10 mins. Spices - salt, pepper and seasonal herbs at terrace, olive oil and vinegar and sugar. Different European languages, mostly English. Few basic games like puzzle and cards. Even though garden is shared with other residents, it is not used by others very often. Private terrace with seating area and possibility to borrow an electrical grill. Great location, short tram ride to old town, Very clean and comfortable. Only minutes from Old Town on the tram. We easily found parking on the side street and easy walk up to second floor. Cozy setting with all the amenities provided. Very charming patio for any spring or summer guest. Owners also speak English and quite hospitable, we would gladly stay there again ! Cozy apartment with great amenities. The location of the apartment was great. The train stop is right out front to take you where ever you need to go. FYI train tickets can be purchased at the Asian grocery store directly across the street. The free parking up and around the corner was very convenient for us. Wir wurden freundlich empfangen von den Eltern des Vermieters. Die Wohnung ist hell, sehr sauber und verfügt über alles, was zum wohnen und kochen benötigt wird. Mit der Bahn sind die Sehenswürdigkeiten gut zu erreichen. Wir konnten sogar direkt vor der Tür parken für 4€ pro Tag und am Wochenende frei. Es hat uns gut gefallen und beim nächsten Besuch in Prag kommen wir gerne wieder hier her. Die Wohnung ist sehr schön eingerichtet und gemütlich. Es war alles sauber und die Küche hat eine super Größe. Die Straßenbahn war auch gleich vor der Tür, was für uns ideal war. Wohnung eignet sich besonders für die Belegung mit zwei Erwachsenen. Da wir mit unseren beiden Kindern reisten, wurde die Eckccouch als Schlafplatz hergerichtet. Dies ist für einige Nächte erträglich, jedoch nicht sonderlich bequem. Sauberkeit und Ausstattung ließen keinen Anlass zur Kritik. Der Vermieter ist sehr zuvorkommend und steht mit Tipps und Hilfsangeboten trotz der Sprachbarriere gern zur Verfügung. Kostenloses Parken ist in einiger Entfernung zur Wohnung (ca.300m) möglich. Wir haben die Zeit genossen und werden bei Gelegenheit wiederkommen. Prag ist allemal eine Reise Wert.